Today there is a growing awareness among hotel owners of the positive impact of resource efficiency on utility bills. They know that cost reduction strategies in the areas of energy and water are critical to the bottom line, particularly when room rates can’t be increased due to a hyper-competitive market. Best of all, the investment associated with the decision to go green at the early design stage is easily paid back in a relatively short amount of time, after which time the hotel is only saving money. Utility cost data simulated using the EDGE software. Revenue and RevPAR data was adapted from STR Global. The owner of a conventionally built hotel typically spends more than $2,000 per guest room each year on energy and water consumption, which represents anywhere from 6 to 20 percent of operating costs (the single largest line item after staffing). The benefit of a resource-efficient hotel only increases with time, as energy prices often rise faster than consumption. Suresh Maramreddy of Apollo Private Equity Fund’s India Real Estate team believes that every dollar saved on operational costs increases asset value by $10. A better product is just as important as the savings associated with it. Given their influence, top hotel brands are keen to demonstrate delivery of an excellent product to their hotel operators as well. It’s critical to get the design right at the outset, as the cost of resource-efficient solutions at the greenfield stage is marginal compared to making corrective measures later. Hoteles City Express, which builds five to 10 hotels each year in Mexico, monitors current performance to optimize its future properties. By comparing bills across 100 existing properties, the budget hotel chain weighs such solutions as reduced glazing, external shading and high-efficiency glass before building each new hotel’s specification. Carlson Rezidor Hotel Group, which owns the Radisson and Park Inn brands, ensures the resource efficiency of its future hotels in Eastern Europe, the Middle East and Africa by turning to EDGE, a green building software and certification system offered by IFC, a member of the World Bank Group. Inge Huijbrechts, Global Vice President of Responsible Business at Carlson, uses EDGE to achieve at least 20 percent less energy, water and embodied energy in materials for a newly designed hotel compared to a base case. Since 2009, Hilton has used an in-house monitoring system with simple scoring to determine benchmarks for its portfolio of more than 4,400 properties. Hilton has reduced energy use by 17 percent, water use by 17 percent and waste output by 29 percent, saving $750 million to date. In the Accra example, EDGE software calculations show that these recommended energy and water-saving solutions would cost approximately US $140,000, to be paid back through operational savings in just one year’s time. 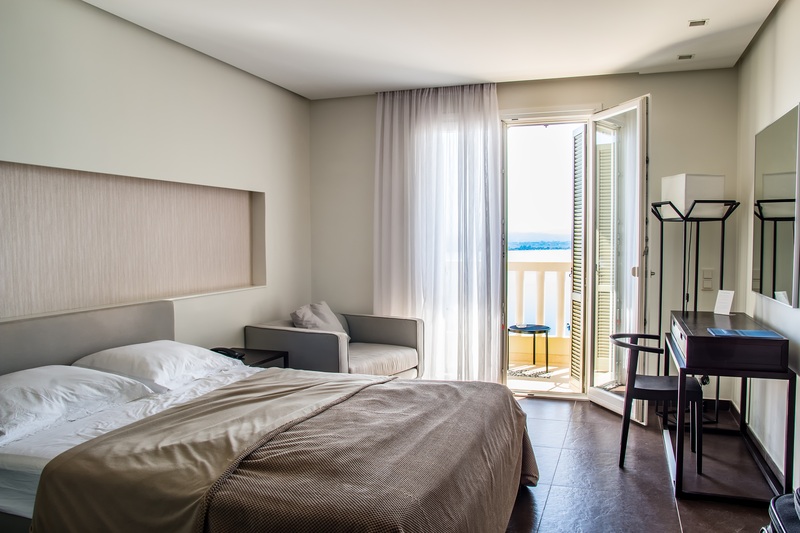 To incur further energy savings, hotel owners can avoid the wastage that comes from air conditioning and lighting usage when no one is in the guest room. While key cards are now common they lose their effectiveness when bypassed (guests are offered multiple cards or use a dummy card to keep the energy running). Solutions can be implemented with negligible impact on guest comfort. Specifying a guest presence detector with a combination of door and movement sensors is an excellent solution. Instead of air-conditioning systems being disabled, the thermostat can be programmed to a predetermined temperature depending on whether a room is occupied, unoccupied or unrented. If a room is unrented, deeper setback can be utilized and automatic window shades can be drawn. The same concept of presence detection can be applied to corridor lighting. Based on the time of day and activity, lighting levels and set points for air conditioning can be cut back to save energy. With a property that is designed smart, hotel owners can be confident that energy and water savings will trigger greater profitability. The extra costs from going green can be recouped in little time, with hotel owners benefiting from utility savings for the rest of their buildings’ lifespans.